After few months in the company I was kindly nominated by Richard to produce an article for our blog. This gave me an opportunity to raise a topic that has been in my mind for the past 18 months. How to cope with two sets of targets that appear to conflict? Is there a way to transform these challenges into opportunities that could yield additional benefits? So, what are we looking at here then? Savings Targets - As anyone working in procurement knows, it is the numbers that count when it comes to savings. Everyone has their targets, something that will definitely drive behaviour and focus (these targets are after all linked to most people’s bonuses). Savings have to be tangible and approved by the stakeholders. 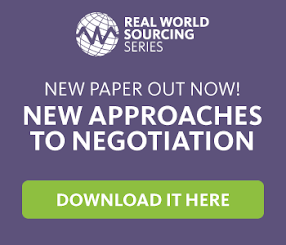 The procurement professionals are not only facing the external challenges to negotiate and source better to produce these results, they also have their work cut out to on the internal sale for their proposals. This often leads to a great deal of tricky management of stakeholders varied priorities and expectations as well as plenty of change management to drive the execution. Small and Medium Enterprises (SMEs) and Diversity - Currently there are no set targets for companies in UK, there is a strong trend indicating that especially larger blue-chip companies are readying themselves. UK Government has set themselves a goal of having 25% of central government spend with Small and Medium sized enterprises (SMEs) by March 2015. Current rate of SME spend is 16%, this leaves high expectations for their G-Cloud purchasing system that is expected to help SMEs to participate in tenders more easily. If the trend in UK Public Sector and in US is anything to go by, we might see mandates for certain levels of SME spend for companies wanting to do business with Public Sector bodies in the future. What help is there then available for companies that want to ensure they advocate diversity in their supply chain? The first thing that comes to mind is robust Spend Analytics. If you are not able to identify and monitor your SME spend, it is going to be very hard to improve on it. Most of the modern tools in this space support the flagging of this spend. The difficulty can sometimes be faced when trying to identify SMEs in your supply chain in a robust manner. Ways to do this can include utilisation of external data (D&B extracts, collaboration with organisations like MSDUK etc), but also can be done via internal exercises (such as online survey for any identified potential SMEs). Additionally you can use eSourcing to support these targets. The use of this technology can help to open up your tenders to larger group of vendors and remove barriers for smaller companies taking part in them. With eTenders you can actively support the participation of SMEs in your tenders whilst ensuring the fairness and transparency of the process. The targets can also be supported by Contract Management and Catalogue systems that provide the user easy way to identify these suppliers. So, going back to the initial dilemma - how can we create an environment where both agendas can flourish? How can Procurement as a function support business to both save their resources and support efforts to diversify the supplier base? In essence it could boil down to value they both provide to the business. My observation working in Procurement was that the value of the diverse supplier base was not always fully identified. In a busy procurement world it was often easy to look into leveraging spend and rationalising supplier base to gain savings. Diversity was seen as an exercise that was done often to satisfy an external target. How can this perception be changed? Can an organisation start identifying and utilising (dare to say, even monetise) the benefits of a diverse supplier base? Can this be used in B2B marketing, supporting corporate responsibility? Communication direct to consumers? I believe there is a way for the businesses to have these two agendas running parallel (whilst supporting each other), required is a better understanding of the benefits they both bring to the table. I would be very interested hearing anyone’s experiences in regards to these? Does your organisation identify the benefits of both? Hey Pavel.. this is of interest.. I could see other large funds asking the same questions in other territories. If the UK Government doesn't start forcing the question first. Hi, I am the SME Director of PSNGB, the industry association for Public Service Network (PSN) suppliers. We are actively working with government bodies to make it easier for SME's to bid for tenders directly and sub-contract to larger companies. We strongly support the idea that SME's are often more fleet of foot and therefore innovative, as well as more cost-effective.